Breeding information below the pictures. A very pregnant splashed doe. Another very pregnant splashed doe. Example of a splashed with poor spread in splashes. In other words, the different colours are clumped. 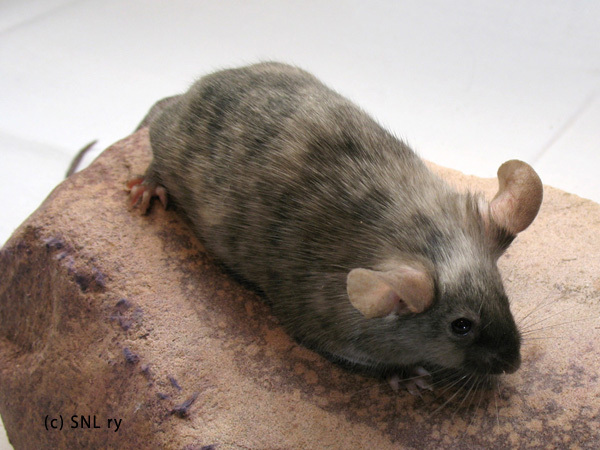 This mouse isn't genetically a tricolor, as it doesn't have clear cut white markings. Satin splashed with chocolate genes. This fuzzy shows very modest splashed markings, with only two shades of colour. Splashed is one of the more recent additions to the Finnish mouse fancy. It was imported to Finland in early 2011 from the Netherlands and Poland. Since then this variety has quickly become popular. Splashed is very attractive looking, and increasing its population is, genetics-wise, fairly easy. According to available information, splashed originated in the laboratory of the National Institutes of Health in US where it was created by gene manipulation. In spite of its laboratory origin this gene can't seemingly be found in the MGI database. 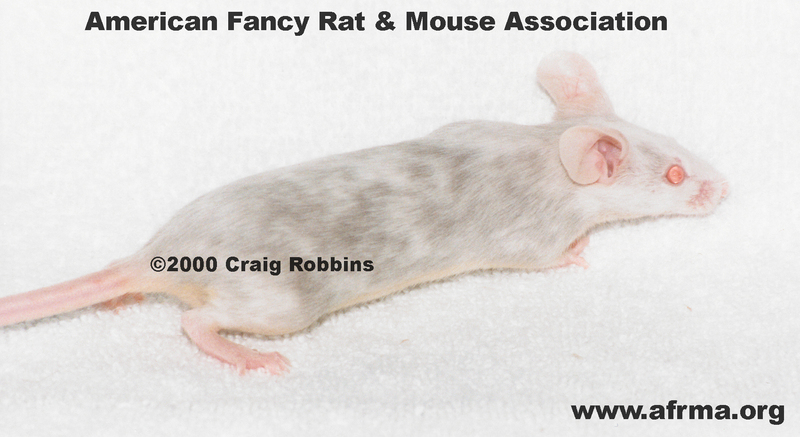 The variety spread from the laboratory to the hands of mouse fanciers in mid 1990's and has since then been bred among the US fancy. German breeder Roland Fischer imported the variety to Germany in the 2000's and from this source it has quickly spread to other European countries. Splashed characteristically has three shades of colour displayed in a splash-like pattern. 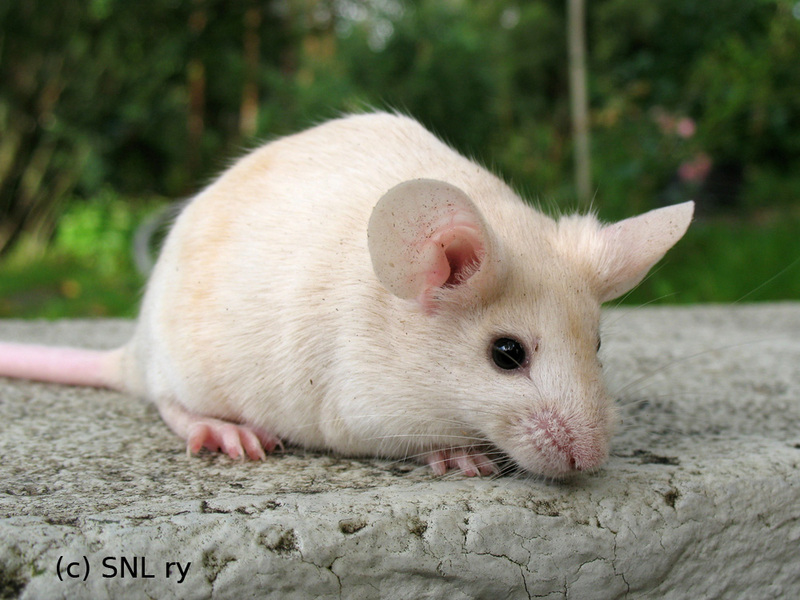 The best splashed mice may even show four different shades. Some splashed mice may have only two shades of colour, and in extreme cases there may be just a small splash of differing colour. Splashed shouldn't have any distinct white markings (splashed with white markings is a tricolor). The splashed gene has no known effect on other than colour. Thus, splashed mice are normal and healthy in every way. How the gene shows in the phenotype is not quite as simple as with most other colour genes. Whether to call this gene dominant, semidominant or recessive is a good question. The splashed pattern is mostly dominant on c-recessive background, but otherwise mostly recessive. Splashed functions in close interaction with the C-locus. What happens is that splashed reverts the effect of c-recessives either completely or partially in parts of the coat and pigmentation, creating an uneven pattern where full colour (corresponding C/* colour) combines with partially diluted colour and the underlying c-recessive colour. This phenomenon is called mosaicism. Splashed pattern may combine with any combination of c-recessive alleles. The underlying c-recessive colour has great effect on the outcome, as do other colour genes, such as Ay, A, b/b, d/d or p/p. Because splashed is usually fully recessive to C/*, it doesn't show on for example a black mouse (a/a B/* C/* D/* P/* Spl/*). 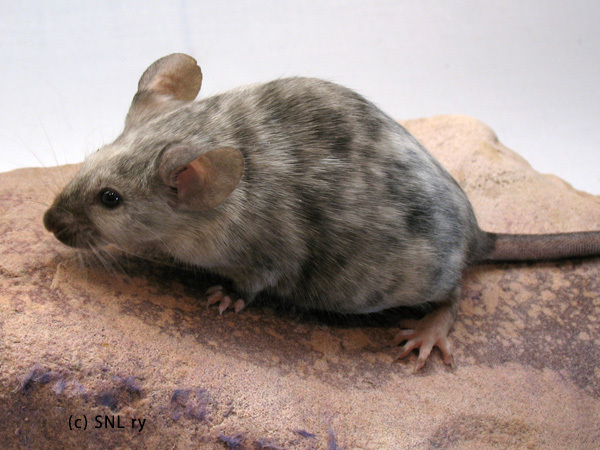 Such a mouse can be a splashed-gene carrier, and breeding a splashed carrying C/* mouse back to a c-recessive mouse may produce splashed offspring. Splashed is clearly dominant in combination with the three most recessive genes and their combinations, whereas its effect on the chinchilla gene cch is already greatly diminished and may not indeed show at all in some cases. I have seen several cases where a solid-coloured cch/* mouse with a splashed parent / splashed parents has produced (sometimes a whole litter of) splashed offspring when bred to another solid-coloured c-recessive mouse, such as siamese. This means that some, but not all, cch/* Spl/* mice show splashed markings. This can be problematic if the splashed gene gets introduced to a line of a genetically chinchilla-based variety (marten sable, chinchilla, etc.). Some US and European breeders have reported that splashed can also produce markings on C/c* background. 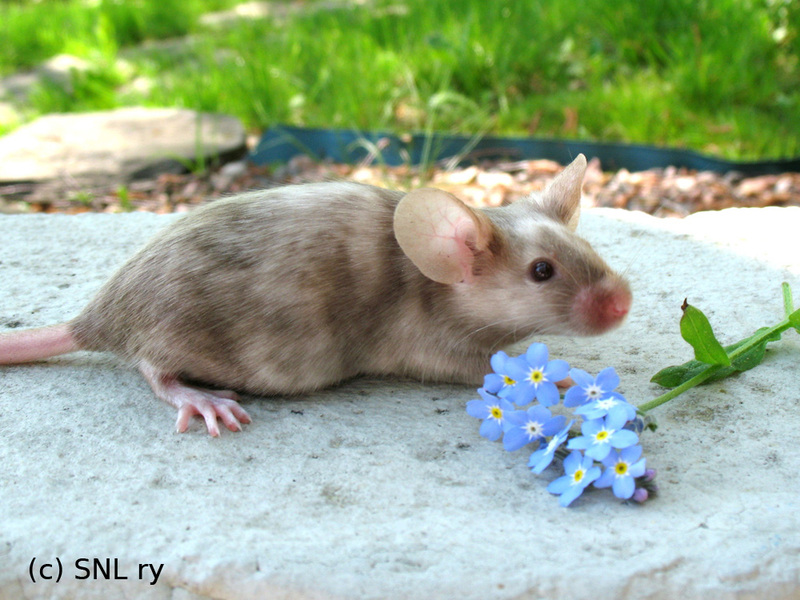 These mice typically show a less distinct lighter splashed pattern on otherwise normal colour when they are young, but the markings disappear at later age. The reason behind this may be that c-recessive genes have, in some cases, a slight effect on the colour even when heterozygous with C, and pink-eyed (p/p) varieties are one such case. This slight effect might just give splashed a chance to show in the phenotype. In order to meet the standard the breeder should aim at an evenly distributed combination of and strong contrast between the different shades of colour. Splashed is at its best when the colour splashes are fairly small, evenly distributed and of three (or more) clearly different colours. The breeder should also pay attention to markings on the belly. 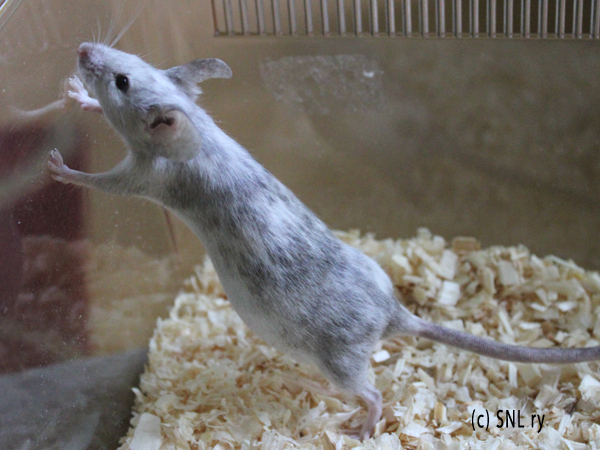 An overall "muddled" colour, large splashes and heavy predominance of just one or two colours are all typical traits of poor quality splashed mice and should be avoided. Other colour faults include distinct white markings, including clearly defined tail tips. 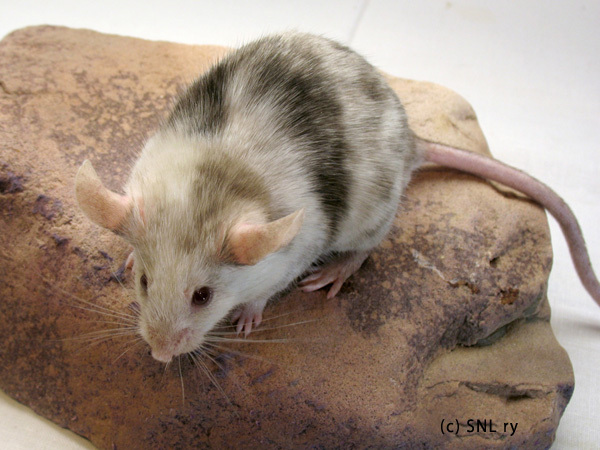 Somewhat surprisingly, too much contrast or too defined colour splashes may also become a problem with splashed, as the phenotype starts to resemble a tricolor even though the mouse doesn't have white markings on it. Not all c-recessive varieties work equally well with splashed. The best ones to use are siamese seal point, colorpoint beige, himalayan, beige and black eyed bone. All combinations including a chinchilla gene are best avoided when breeding splashed. Pink eyed white on the other hand easily results in a very light and predominantly white pattern. All pointed genotypes of splashed have points and this is not considered a fault in the Finnish show standard. Eye colour is mostly determined by the underlying c-recessive genotype, but it should be remembered that splashed may alter the colour of one eye or even both eyes. It is not uncommon for splashed to be odd-eyed. After a while it is a good idea to try to favour breeding splashed to splashed in order to get the colour to breed true. This also makes the quality of markings more easy to predict, as the breeding potential of the parents can be seen in their phenotypes. 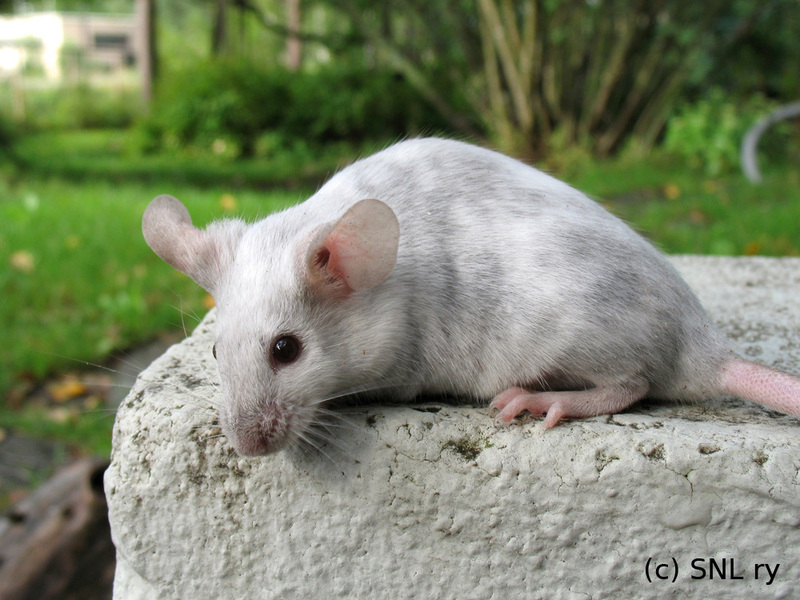 Breeding splashed to a solid coloured c-recessive mouse can be a case of hit-and-miss; unless the latter has good quality splashed in its background, the modifying genes it carries may be less ideal for breeding splashed. 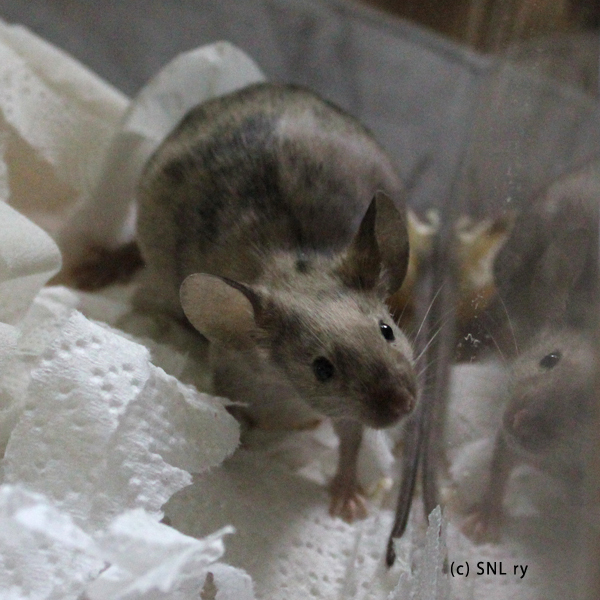 The best show quality splashed mice are nonagouti black. Adding other colour genes to splashed results in several quite attractive phenotypes, which may however have lost the contrast between different colour shades to such extent that they may no longer match the standard or may not do as well at shows. Blue dilution d/d produces beautiful blue-toned splasheds which may still sport enough contrast between the shades show-wise. Chocolate-based splasheds are also quite attractive. However, they already have much weaker contrast. Splashed mice with the agouti gene have ticked splashes of colour, and their markings are much less distinct. Ay-based splasheds, in turn, are a mixture of white/light cream, cream and pale yellow splashes. If the umbrous-factor is added to the mix, the result is interesting: the dark shading separates to show yet another colour of splashes. Ay-based splasheds are often beautiful at young age, but the colouring tends to flatten out as they get older. They may not be good enough for showing, but they make very nice looking pets. The tan-gene at is not that suitable to be combined with splashed. It results in fox-bellied splasheds, and a fox belly is considered a disqualifying fault in the Finnish standard. 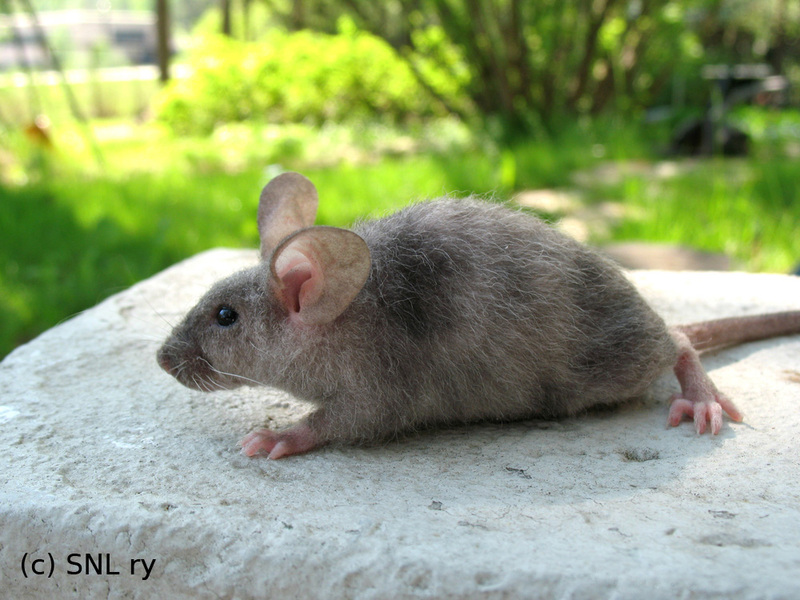 If a splashed mouse has the tan-gene, its fox belly may show light tan coloured splashes. Pink eyed dilution p/p combined with splashed is unusual due to the linking between C- and P-loci, but they do exist. A genetically pink-eyed (p/p) splashed may resemble a pink-eyed brindle quite a lot. For example, a p/p splashed with nice pattern of colour is not much different from dove brindle. They could even be shown as brindles, if the mouse matches the brindle standard better than the splashed standard.